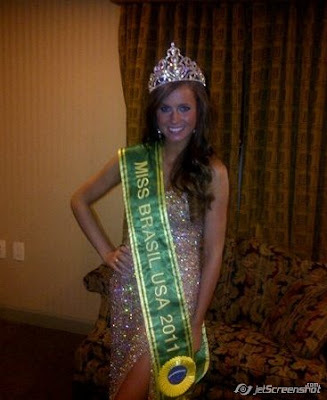 Fabulous Channel is proud to announce that our Miss Brazil LA 2011, Fernanda Samaia won the National Tittle in NY. We just got the results and she is the new MISS BRAZIL USA 2011! Congrats Fernanda, we are all very happy for you girl.Well done! Fernanda was styled by Giselle Claudino :)She was wearing an amazing gown with all hand made work and lots of sparkly stones! Fernanda with her new crown and sash in NY! Pass year's winner with this year's winner posing with producer Ariel Del Mundo in NY right after results! Now some of the LA Winning Moments! My Interview with Fernanda Samaia for Brasil Soul TV! Fernanda with the Los Angeles pageant producer Ariel Del Mundo! More pictures of NY to come!!Aguardem! Miss Brazil Los Angeles 2011 Full Coverage!